SQUARE ENIX® brings WORLD OF FINAL FANTASY™ to North American retailers this October with many ways for fans to experience the wonderful world of Grymoire. FINAL FANTASY ®fans ready to embark on the epic journey will have many options to pre-order the Collector’s Edition and other offerings as listed below. The WORLD OF FINAL FANTASY – Welcome to Grymoire Trailer can be viewed at: https://youtu.be/cjpdOV5eSuE. WORLD OF FINAL FANTASY, a brand-new title in the FINAL FANTASY franchise, combines classic RPG gameplay mechanics with fresh and imaginative toy-like visuals to welcome both fans and newcomers to the series. 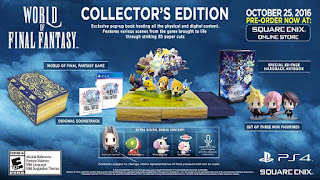 Players will lead a pair of twins through varied FINAL FANTASY worlds and capture and raise such adorably familiar beasts as cactuar, chocobo and behemoth to discover alternate forms and learn new abilities. This title is rated E10+ (Everyone 10+). Please visit the Entertainment Software Rating Board (ESRB) website at www.esrb.org for more information about ratings.